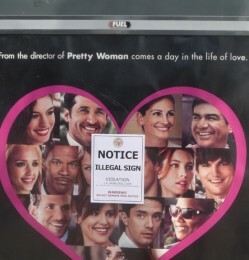 Our friends at the interesting and informative urban blogs LAist and Curbed LA have reported on the apparent posting of faux-official “illegal sign” notices on a number of illegal movie-poster-style signs owned by Fuel Outdoor. See Activists Do Their Own Guerrilla Enforcement of Illegal Billboards and Venice Ads Hit. A New York company named Metrolights started putting up the approximately 20 sq. ft. lighted signs attached to the sides of buildings or bolted to sidewalks at gas stations and mini-malls more than five years ago. Cited by the city for violating its billboard ban, the company sued, but lost in the 9th Circuit Court of Appeals more than a year ago. The company–now called Fuel Outdoor–petitioned for review by the U.S. Supreme Court, but was denied in December of last year. See Supreme Court Won’t Hear Metrolights Appeal. While anti-billboard activists have urged the city to force the removal of the illegal signs and seek recovery of “ill-gotten” gains, the city hasn’t indicated what action it intends to pursue. 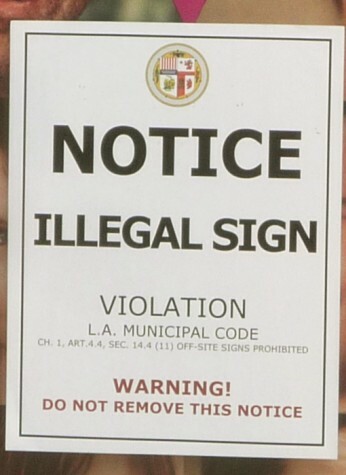 In fact, officials don’t know exactly how many signs Fuel Outdoor has in the city, or where all of them are located, since the company never sought any required sign permits. However, they are distributed through a wide area of the city, and officials have estimated that there are several hundred in total.